[The Native American] story tellers of the camp related, with dramatic gestures, stories of the Days of the Grandfathers, in the beginning of the Newness of Things. Nothing was too large or too small to come within the bounds of their beliefs, or within the play of their fancy. 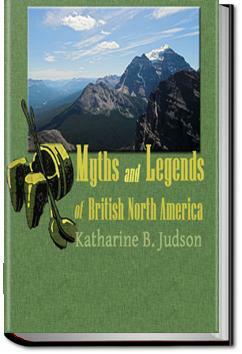 Only authentic myths and legends have been used in the compilation of this volume. The leading authorities are the publications of the United States Bureau of Ethnology, of the Jesup North Pacific Expedition, of the Memoirs of the American Museum of Natural History, as well as the ethnological publications of the Canadian Bureau of Mines. As in all other volumes of this series, only the quaint, the pure, and the beautiful, has been taken from the tales of the Indians. Any one wishing pure ethnology, good and bad together, would do better to go to ethnological reports. The material here is from these tribes: Haida, Eastern Eskimo, Bella Coola, Wyandot, Cree, Thompson River, Carrier, Shuswap, Lillooet, Ojibwa, Central Eskimo, Chicotin, Kwakiutl, Nicola Valley and Fraser River, Algonquin. . . .The chief’s daughter was lying near by. As the men dug, a sudden noise startled them. They jumped back. They had broken through the floor of the Sky Land, and the tree and the chief’s daughter fell through. Now the world beneath was a great sheet of water. There was no land anywhere. Swans swimming about on the water heard a peal of thunder. It was the first peal ever heard in this world. When they looked upward, they saw the tree and the strange woman falling from the Sky Land. One of them said, “What strange thing is falling down?” Then he added, “The water will not hold her up. Let us swim together so she will fall upon our backs.” So the chief’s daughter fell upon their backs, and rested there.